This is a tablescape we did at Old Glory Denver this week, to inspire your own table decor and help you pick up any last minute Thanksgiving decor goods you might need for holiday gatherings big and small. And to help you prepare even more, here are a few of our tips and styling insights to take the stress out of the holiday—at least in decorating for it! We like to start with a blank slate: a bare table in front of us and plenty of ideas in our heads. Our overall Old Glory Style philosophy is based on the belief that you don’t know until you try, and that every idea is worth trying. Even the “bad” ones lead to even better ideas and design solutions. As my kids’ elementary art teacher used to say, there are no mistakes in art! Sometimes (most of the time for us), the final product looks nothing like what you had envisioned. But that is okay! It will be even better because more and more ideas come to you in the process and creativity and hands-on hard work take over. For a holiday like Thanksgiving, the table setting and design has to be practical for large groups and for easy dining, but that doesn’t mean it can’t beautiful and unexpected too. We like to make our Thanksgiving table festive and fun, not too perfect or polished, and full of unexpected and welcoming finishing touches that make us want to sit there long after the turkey is done and dusted. Layer different plates and different dish styles to create a visual and practical variety. Use height to engage the eye on different levels, with some dishes raised on breadboards or even other dishes, greenery that reaches upward, and place setting details that are a little different at each seat. 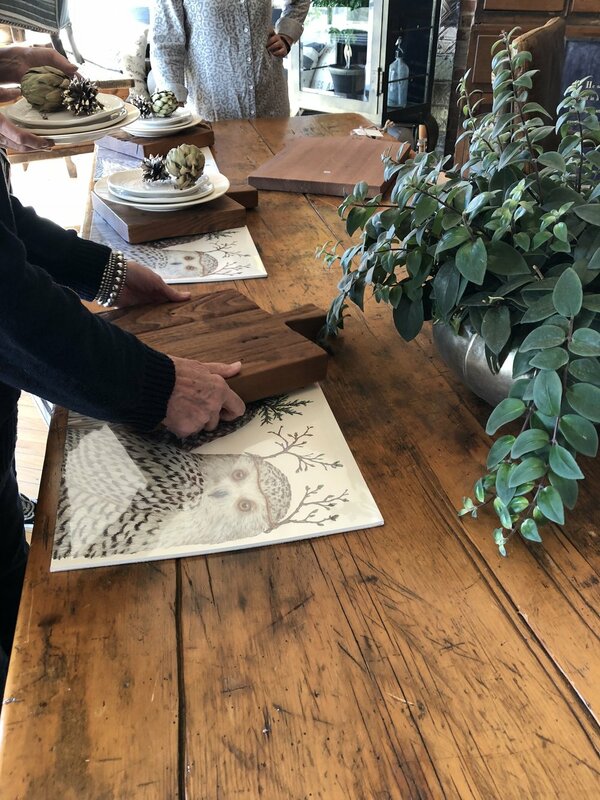 Play with texture—the worn wood of old breadboards with the smoothness of ceramic dishes, the beautiful patina on vintage silverware with paper placemats and quote cards with just the right amount of roughness. The meal can engage all the senses, not just taste! 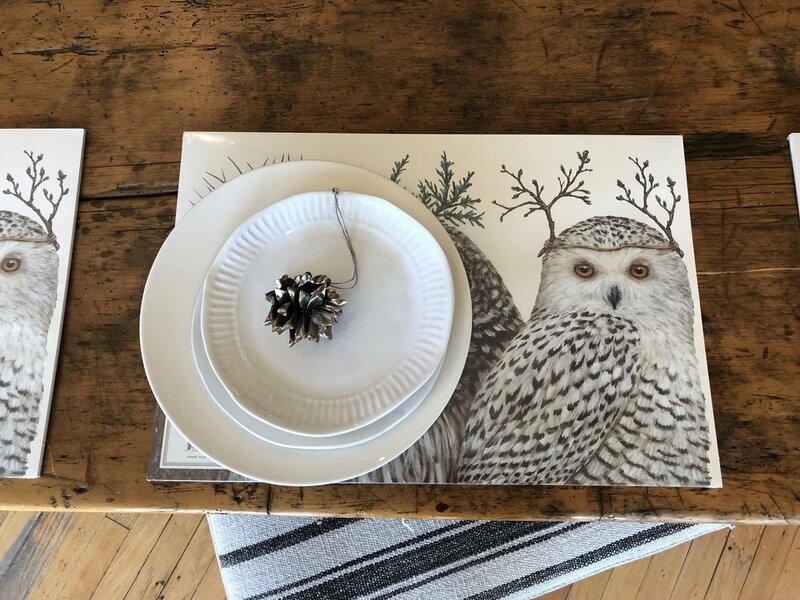 Use ornaments as plate decor—we love the beautiful simplicity of these metal pinecone ornaments, combined with the clean whiteness of the plates and the neutral worn-ness of the table. Use dried (or fresh) fruits and vegetables as decor to make the whole table come alive. Our go to’s are dried artichokes and pomegranates, because of the splash of color and warmth they add to the table. We also love adding greenery anywhere we can, because it adds so much vitality and warmth as well. 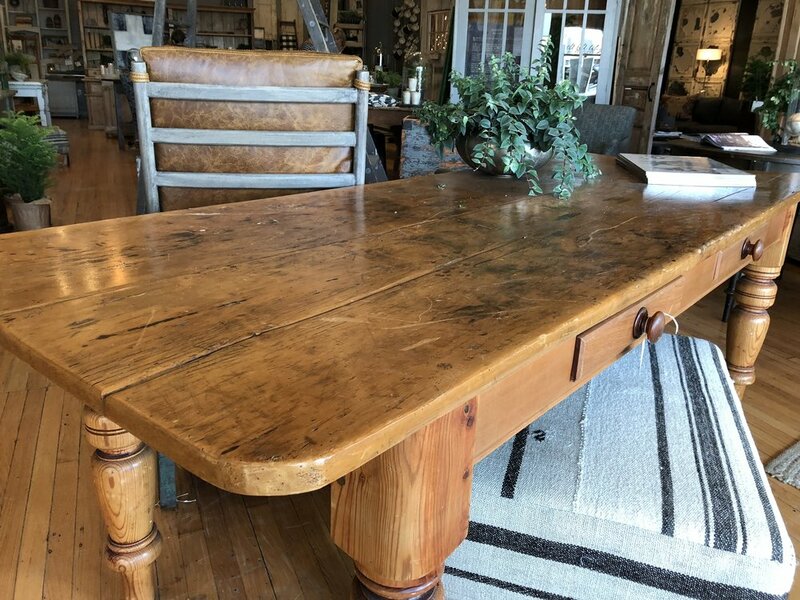 Collections are one of the trademarks of Old Glory Style, and they can play a huge part in a tablescape design. This time of year is the perfect time to bring out your favorite collections and put them on display, and even put them to good use! From vintage silverware you can put at every place setting, to your favorite collection of old breadboards you can use as serving pieces or chargers, to your favorite set of mismatched vintage vases and jars for greenery or silverware, the Thanksgiving table is a great way to put your collections to good use, both visually and practically. And finally, another one of our favorite elements of Old Glory Style is the “mix not the match.” In addition to combining and contrasting different textures, tones, and dining ware styles, you can creatively display ordinary objects all around for unexpected touches, mixing up people’s expectations and creating an uncommon and beautiful finished product. 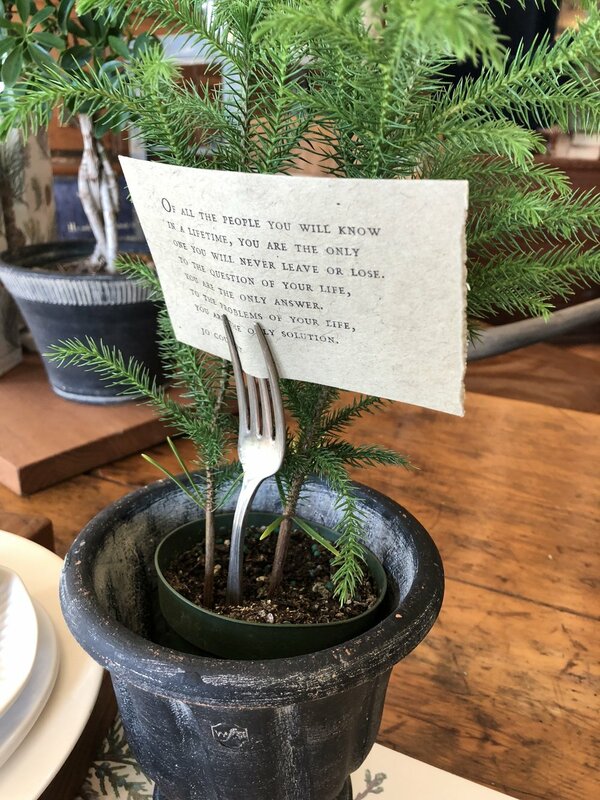 We came up with the idea at the store of putting vintage silverware in the soil of our potted pine trees, with quote cards between the fork’s prongs to make each setting a little more inspiring and unexpected. Now, not everyone would want to use a fork that was dipped in soil…but sometimes it’s better to put what looks good over what us useful every once in a while, right? Fair warning: if you have as much fun tablescape-ing as we do every year, you might never want the meal to end! But don’t worry, the holidays are just beginning and this time of year, there are endless excuses to make your home beautiful and decorate for the season.